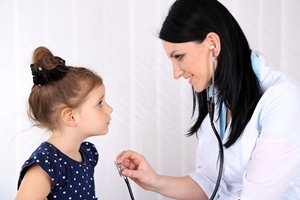 Even with their fathers there, the first visit to a doctor's office can be stressful for kids. Some may not know what's going on, while others may remember past visits and put up a fight in the car or waiting room. Doctors try their best, but some kids may hate shots so much that fathers should step in and help their kid get through the appointment with flying colors. However, stay away from these common sayings before your child's first shot. 'It doesn't even hurt:' Some kids can take a direct hit during a sports game and be fine, but they still fear the doctor. Dismissing these fears may only make your child feel more alone. 'It's good for you:' If it doesn't work with vegetables at the dinner table, it's probably not going to work here. 'Just focus on the doctor:' Not only should your kid not be looking at the needle, you should distract him or her as much as possible with conversation, music or just pointing things out around the room. 'Do it for daddy:' This may work for older kids, but younger ones are likely so anxious about the shot that they can't get out of their heads long enough for this to work. 'Don't cry:' You might not think it's normal to cry during a shot, but you shouldn't put any more pressure on your kid than there already is. Remember, kids look to you for cues on how to act. If you empathize too much or look worried, they will assume the worst. That doesn't mean you should be cold. Just say it's a little pinch or sting and will be over in a second without adding to the drama of the moment.